Micro Art Studio is definitely one of the best manufacturers of accessories for wargames (they have also recently created their own game: The Wolsung Steampunk Skirmish Game – see review) . Over the years, we have seen a number of interesting models, bases and accessories suitable for both wargame players and collectors. This time Micro Art Studio decided to treat us with products especially dedicated for Eldar army collectors. we can order one of the four sets of battle bases named Wraithstone through the company's website. The smallest are twenty-five millimeters in diameter, the next larger size is 40 millimeters, another 60 millimeters, and the largest elliptical bases are 120 millimeters in diameter. These products are not cheap, but they are the perfect complement to any Eldar army. This does not mean , however, that those accessories won’t fit into the collection of other figures, I'm sure that Wraithstone bases can be used in many situations. 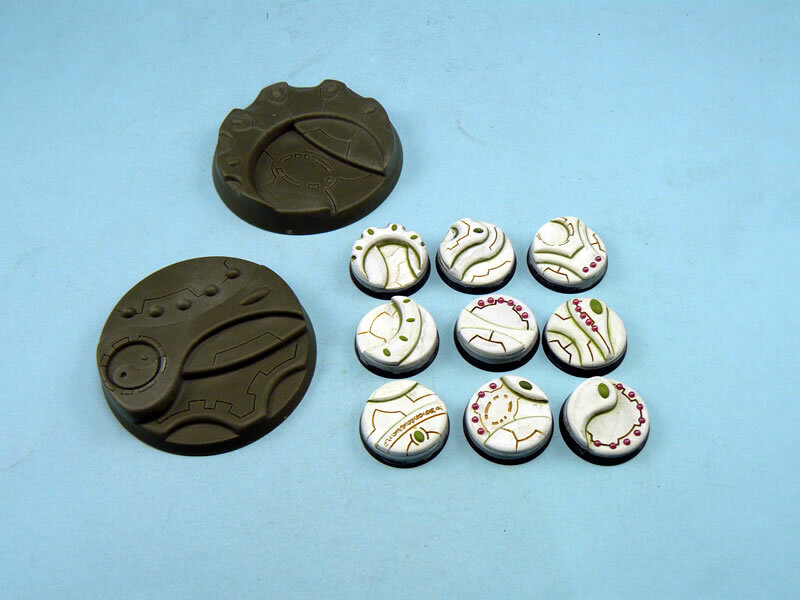 When looking at the smallest of the reviewed bases (25 mm in diameter) we can see that the manufacturer prepared as many as 12 different designs. Each of them is unique and differs significantly from the others, so we don’t have a feeling of repetitiveness. 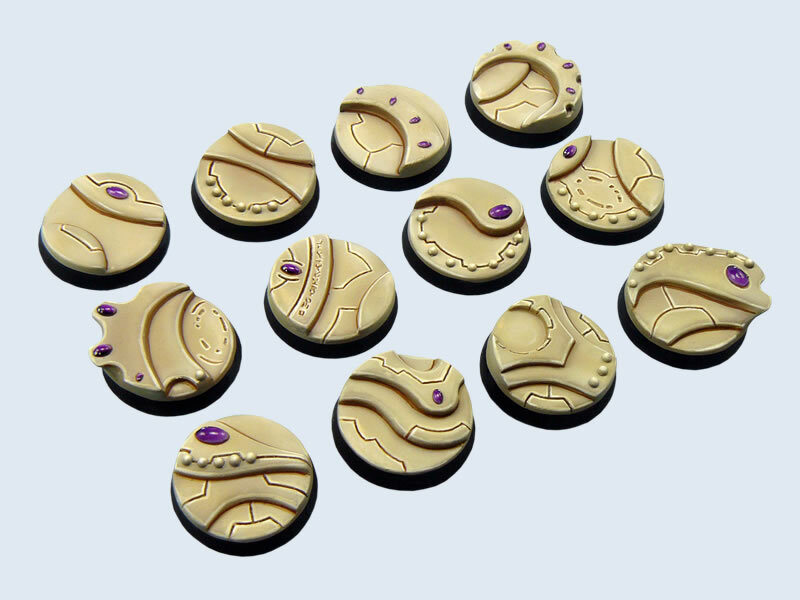 25 mm Wraithstone bases are decorated with carvings , runes , crystals and various themes that can be related to Eldar. The product is successfully made to resemble a surface crafted from the material called wraithstone. Both the quality of the resin and crafting is surprisingly high and it’s hard to find any air boules, miscasts or other imperfections. I think these bases are perfect for most standard units in the Eldar army, the only thing that can be upsetting is uneven footing. Some of the 25 mm designs have lot of differences in ground levels and it can be challenging to successfully place the miniatures . On the other hand, it allows for greater diversity among individual army units. The 40-millimeter based are similar to their smaller counterparts, but they come in six different patterns. These accessories have smaller change in elevation high, which allows for easy positioning of the models. These bases are large enough, so they can accommodate larger units, such as unique characters such as Autarch, Wraithguards or other special models. Since its creators (concept by Sasha Tynan and sculpted by Sebastian Makowski) had more to work with, 40 mm bases are an interesting study of Eldar creations. Most of those bases have two or three different elevation heights, definitely more carvings and gems. Most of the shapes and ornamentations are created by delicate and rounded lines, that intersect the base in a very elegant way, creating interesting and harmonic designs. In case of 60 millimeter Wraithstone Battle Bases have two very different forms, but both are extremely aesthetically pleasing. One of them is simpler and the second much more complex. The first one does not have only one distinctive elevation (there is a second small elevation), which allows for easy placement of figures such as Wraithlord or any other large military units (for example walkers). Thanks to two (or even three) distinctive height levels we can position our miniature “flatly” on both legs using one flat surface or choose more “kneeling” or in a move position by using the difference in height. The second base has been created with more images and details such as runes, carved lines and sigils. It’s more difficult to pose your model on that base but it is definitely artistically pleasing. What we see first is a beautiful and simply sculptured yin and yang sign. Opposing it there is a big gem (soulstone). At the lower base levels there are carvings and five strange “half spheres” sticking out from the surface. Design such as this is difficult to utilize, but it can give very satisfactory results when used to set a model properly. Personally, I think the most interesting piece from the Wraithstone Bases set is the elliptical 120 mm battle base. It is fit for all the biggest models, you can safely put tanks, flyers, other vehicles and even Wraithknight on it (it’s a base created almost perfectly for that grand miniature). More importantly, it is almost ideal for a diorama, presenting some alien combat struggle or most important Eldar units together (for example Phoenix Lords). That base is mostly flat (there are elevations but with not any significant height), so positioning and gluing miniatures should not cause any serious problems. At the same time, the battle base is strongly decorated in a way that produces a very positive aesthetic experience. The entire Wraithstone battle bases series created and sold by Micro Art Studio looks fantastic. The creators of hose accessories were able to strike a balance between usability and ornamentation. Simple and easy aesthetic designs will strike a chord in the soul of any Eldar army collector. It is worth mentioning these bases in connection with the recent launch of the new Eldar miniatures and codex released by Games Workshop. For me Wraithstone bases are a perfect complement accessories for old and new Eldar models.